On Wednesdays we are thrilled to fling open the doors to all of YOU! We love hearing your dreaming stories…the lessons you’ve learned, the roads you’ve walked, the dreams He’s planted in your hearts! Today we are excited to welcome back April Ayers to God-sized Dreams. She is sharing a little about what she is learning as she waits on God. Thanks for being here again, April! Waiting is something I have never been good at. I would definitely call myself an impatient person! It is as if there are wheels turning inside of me all of the time, and I struggle to keep up with myself- never quite being able to catch up. Hurry….hurry…hurry…. The challenge of the wait most recently lies in waiting on my dream, a dream that I have fervently prayed over for almost 4 years now. I struggle to find contentment in the life God has me in Right Now….All of my needs are met, I am blessed with immense love, and I’m sure many would say that I have more than enough. And yet, like a child wanting more- I feel this tug in my soul that I cannot shake. This certainty that my family and I are meant to be somewhere else. That if only God would open up that door we are waiting on, the tug would finally give and relief would finally be felt. As I was reading in my quiet time the other day, I came upon several verses that I was sure the Lord was speaking directly to me…. Psalm 27:14– Wait for the Lord. Be strong and take heart and wait for the Lord. Psalm 27:14- Wait for the Lord. Be strong and take heart and wait for the Lord. Lamentations 3:25– I say to myself, “The Lord is my portion; therefore I will wait for Him. ”The Lord is good to those whose hope is in Him, to the one who seeks Him. It is good to quietly wait for the salvation of the Lord. Psalm 5:3– In the morning, O Lord, you hear my voice; in the morning I lay my requests before you and wait in expectation. And then as if this wasn’t enough, I went for a hike and the message I listened to was an amazing one on ‘Waiting on God’s Timing’. Why does God want us to wait on Him? If the dream in my heart isn’t sinful, harmful, and I believe it would actually even better the lives of my husband, myself, and our kids- then why isn’t God answering our prayers? As I meditate on these promises, He reveals to me that I don’t need to know all of the answers. And I don’t need to feel in such a hurry. He holds my life in the palm of His mighty hand! 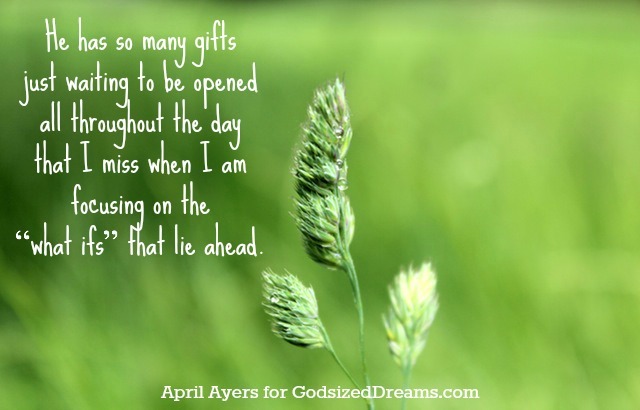 He has so many gifts just waiting to be opened all throughout the day that I miss when I am focusing on the “what ifs” that lie ahead. It is a daily lesson in trust. One in which I am challenged to let my Heavenly Father keep hold of the reigns, and trust Him to lead me to a dream that will be better than I ever imagined. As I meditate on these promises, He reveals to me that I don’t need to know all of the answers. Lord please give me patience as you prepare Your path for me in the days that lie ahead, and forgive me for doubting that Your dream could ever be more than my own. Wow, I felt like I wrote this, each sentence rang a bell and touched my spirit so deep. I am closing in on praying daily for almost four years for the same dream. waiting for one of the largest companies in the world to decide on my product. They have had it in review for over a month so far and I just sit and tell myself God is good, He wouldn’t have held me up with His strong right arm in all of the deep waves if this is not for me. Waiting on the Lord is a time to breathe deep, read His Word, pray daily specific prayers and yield to the Spirit in all things. I don’t want this to be a flesh thing, I want what He has, which is higher and better than my ways. Thank you for sharing, I need this and God gave me confirmation that waiting is full of promise! What an exciting dream!! He definitely uses the waiting room to refine us and draw us near to Him! Prayers for your dream as well! April, I feel like this was written for me. I’ve been waiting and praying for years for God to bless my freelancing business, establish a vocation for my husband and open a door for us to move out of this broken house that we can’t afford to fix and out of this scary neighborhood that keeps getting scarier. It’s such a temptation sometimes to become discouraged, wondering why He keeps leaving us here, waiting, but like you I’ve grown so much in the waiting. A couple of weeks ago, my husband and I were grocery shopping when a woman approached us — a complete stranger to both of us — and told us that she felt that the Holy Spirit had something for her to tell my husband. She told him that God does have a place for him, and that we both need to be patient because it’s not just us who He’s working to prepare–there are other people involved in God’s plans for us and He’s working on getting them ready as well. I don’t know if that’s the golden answer to your question, but it’s a good reminder that He sees the whole forest when all we can see are a few trees. I am sitting here with tears streaming down my face. I feel like the Lord just spoke to me through your words! Yesterday was kind of a breaking day for me in this journey just feeling in total despair and hopelessness. I asked Him to just tell me something….so that I would know either to keep on waiting or to hang the dream up. I felt this morning in my quiet time very clearly that He was telling me to just keep waiting on Him and trust Him. Your words just confirmed this again! How amazing of an experience for you to experience an actual angel to give you hope. God is so amazing!!! Prayers for you dream as well!